Keeping Teeth Straight After Invisalign in Westampton is Easy! Once you’ve invested the time and money into fixing the alignment of your teeth, the last thing that you want is to lose the beautiful results that your orthodontic treatment has provided. If you’ve had braces or even Invisalign in Westhampton, you need to wear a retainer to maintain your newly straightened smile. Learn more about why retainers are so crucial to keeping your straightened teeth for a lifetime in this week’s blog post. It can be tempting to feel more comfortable with your smile once you’ve undergone an orthodontic treatment, making it easy to ignore wearing your retainer. However, there are many studies that show that your teeth can shift into the incorrect places once again if your straightened results aren’t finalized with the help of a retainer. Follow these tips to make sure that orthodontic treatment doesn’t go to waste! 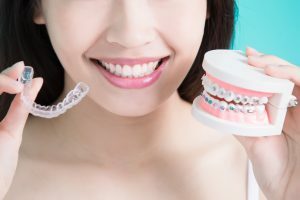 What is a Fixed Retainer? Your cosmetic dentist in Westhampton recommends fixed retainers after any orthodontic treatment. Why? They work to prevent your teeth from shifting back to their original, incorrect positions. Fixed retainers are fine metal wires that are connected to the back of your teeth. These little wires are what work to prevent your teeth from moving. Just as with your orthodontic treatment, they might feel a bit weird to wear at first, but you’ll get used to them in no time! It’s Important to Wear Your Retainer Even If It’s Removable! In some cases, your dentist may recommend a retainer that can be removed rather than fixed to your teeth. In that case, you’ll be responsible for ensuring that you keep your orthodontic results. This means wearing your retainer for the recommended time without wavering. Plus, one bonus about removable retainers is that they can actually protect your teeth from grinding while you sleep. You Must Keep Your Retainer Clean, Too! If you’re wearing your retainer every night as directed, cleaning it is extremely important to ensure you don’t face a new dental problem. Don’t scrub them with toothpaste as it can be abrasive to the smooth plastic that your retainers are created from. Instead, ask your dentist for professional products or stick to a soft-bristled toothbrush and water. Visiting your local dentist in Westhampton will help you keep your teeth in great condition before, during, and after any orthodontic treatment. They will examine the teeth (and orthodontic treatment or retainer) to make sure everything is in it’s best shape. Then, of course, they’ll complete a deep cleaning as well. If you want quality orthodontic treatment or if you’ve already had a great orthodontic experience, you’ll also need a great dentist to help you with post-care as well. Here at Mt. Holly Family Dentistry, our goal is simple – we want to meet your needs to keep your smile in it’s best shape possible. This means that it doesn’t matter what treatment, procedure, or post-care that you need. We’re here for you! Call us today to see if we can help maintain that bright, straight smile of yours. Comments Off on Keeping Teeth Straight After Invisalign in Westampton is Easy!